USANA, word! 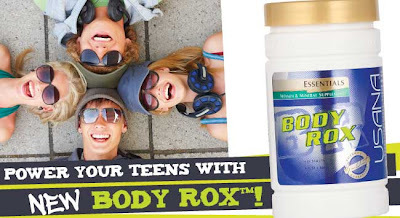 : USANA Body Rox: POWER your teen! Beep, beep, beep. Alarm goes off. Slowly crawl out of bed. Monday morning again. Get dressed and grab a quick breakfast on the go. Walk to the bus stop. Arrive at school. English, Science, Physical education, Geography and Computer class. Hang out with friends for lunch. Maths in the afternoon and sports practice after school. Catch the bus back home. Play video games. Homework. Do some chores around the house. Go to the movies with friends in the night. Sleep (if you’re lucky). Then the day starts all over again…talk about a busy lifestyle. As we know nutrition plays an important role in everyone’s health but it is especially important during adolescence and the teenage years of growth, development and physical maturation. With teenagers constantly in “drive” mode, they need to make sure that they are receiving the adequate nutrients their bodies need. USANA’s New! 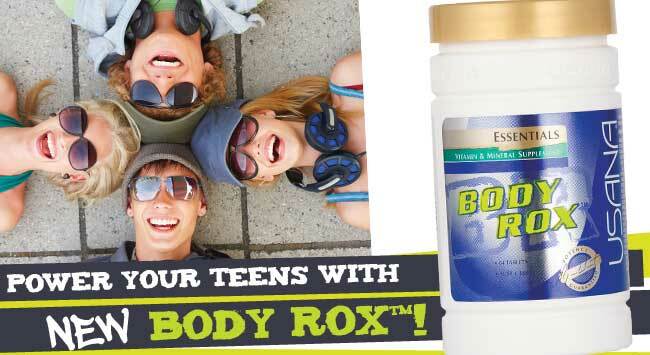 and improved Body RoxTM specifically formulated for teens will help teenagers to have the power they need to be in “drive” mode at any time of the day, no matter what activity they are participating in. With more energy support from increased levels of B1, B2, B3, B6 and B12, teens will be supported to have normal energy production and stamina…which could mean winning the final point on the sports field. The upgrade also looks after teens’ skin (we know what those awkward teenage years are like..hello pimples!!). We haven’t forgotten about the school smarts that are essential for teens so that they can impress their teachers (and trick them into thinking they’ve done some extra homework). We want to support teens to help them work at their very best. Body RoxTM also helps with active lifestyle support, supporting healthy bones, skeleton structure and teeth. Another benefit is that their sharp eyes will be supported, which means they won’t miss out on anything in the classroom (or more likely they won’t miss out on getting to see that person they’ve had their eye on for a while). To round it all off, everyday health and immunity is supported, which is essential for teens when they’re constantly on the go. So if your teen needs a little power so that they can stay in “drive mode”..then get them to try the New! Body RoxTM!